Poinsettia (scientific name "Euphorbia pulcherrima"), also known as "Mexican flame leaf", "Christmas star", or "Noche Buena", is a sub-tropical plant native to southern Mexico and Central America. Poinsettia is a small shrub or tree, with dark green leaves, that produces striking red flowers around Christmas time, and hence is often used as a kind of floral Christmas decoration. 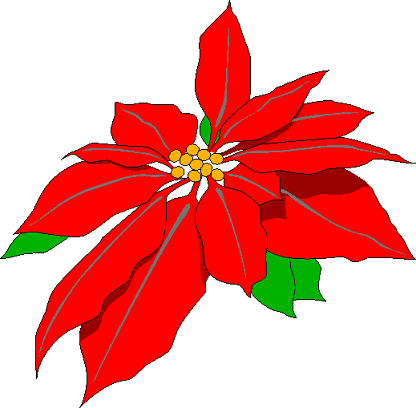 There is a Mexican legend (dating from the 16th Century) which links poinsettia to Christmas. According to the legend, a child who could not afford a gift to offer Jesus Christ at Christmas, was inspired by an angel to pick some weeds from the roadside on Christmas Eve. The angel told the child that a humble gift, if given in love, would be acceptable in God's eyes. When the weeds were brought into s church, the weeds flowered into bright red flowers, and the congregation agreed that they had witnessed a Christmas miracle. The blood red color of the flowers is said to represent the blood sacrifice of Jesus Christ on the cross. Poinsettia was introduced to the United States by Joel Roberts Poinsett (after whom the English name of the plant derives) in 1825. Large scale cultivation of Poinsettia in the USA, including use of a secret grafting technique to produce more attractive plants, began in the 20th Century with the Ecke family, who for many years had a virtual monopoly on Poinsettia sales. Additionally, Paul Ecke, Jr. helped to greatly strengthen the association between Poinsettia and Christmas by sending plants to television stations, and even appearing on some television broadcasts himself.